The Barmy Gunner Mouse is a breed of mouse found in the Harbour. Wild-eyed and along for the ride! She's not much for this whole piracy business, but being able to earn her keep by firing cannons all day is a dream come true for this lover of fire and explosions! The Barmy Gunner Mouse has no specific preference for any kind of cheese. The Barmy Gunner Mouse drops the Pirate Crew Egg during the annual Spring Egg Hunt. 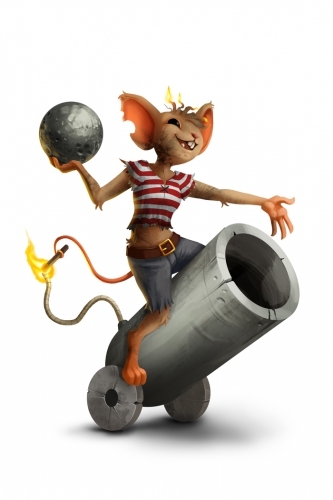 11 April 2017: The Barmy Gunner Mouse was added to the game with the introduction of new content to the Harbour location. This page was last edited on 6 December 2018, at 19:35.